SANSON - Geographiae Sacrae Tabula, que totius orbis partes continent. SANSON, N. - Geographiae Sacrae Tabula, que totius orbis partes continent. Geographiae Sacrae Tabula, que totius orbis partes continent. 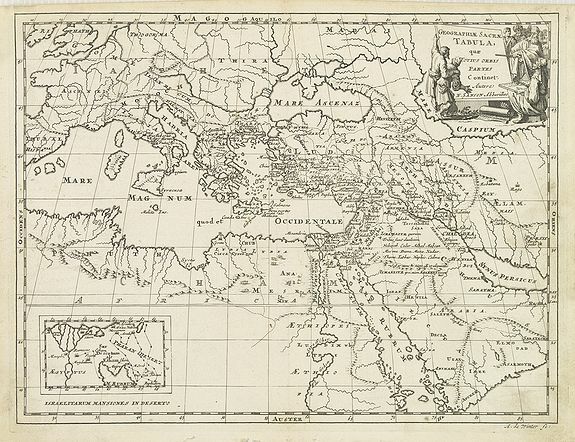 - SANSON, N.
Title : Geographiae Sacrae Tabula, que totius orbis partes continent.. Date : Amsterdam / Utrecht, 1680. Size : 7.3 x 11.1 inches. / 18.5 x 28.2 cm. Description :Attractive map of the Mediterranean and countries bordering, extending eastwards to include the Arabian Peninsula. Including the Black Sea up to the Caspian Sea. Condition : Age toning of paper, mainly marginal. Dark impression.